An outtake from our previous photo shoot. Well, it seems like the end of February is the perfect time to write it up. 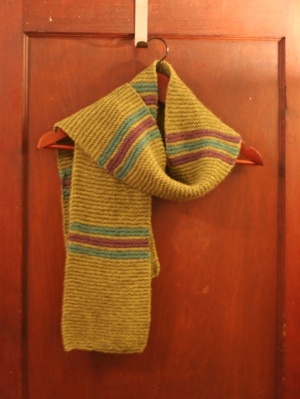 Technically, I suppose, I knit this up at the beginning of January, when I decided I needed a better wool scarf (the first two I knit – back when I was just learning to knit – were both cowls, the first way too long and the second too short to wrap twice but two long to just wrap once). Anyway, I decided I wanted to start the New Year by knitting something easy, but still pretty. I have accumulated a lot of Cascade Eco+ (it is gorgeous to knit with) so I picked three colours and set to work thinking about how best to knit them up. Main colour – in real life, it's much more green. I wanted something quick, so colour work was out, but I also wanted the scarf to have a main colour (and some symmetry), so any stripes would need to be fairly far apart, but not so far that the scarf with hang out the bottom of my coat (I hate that). And thus, the Fake Spring Scarf was born. 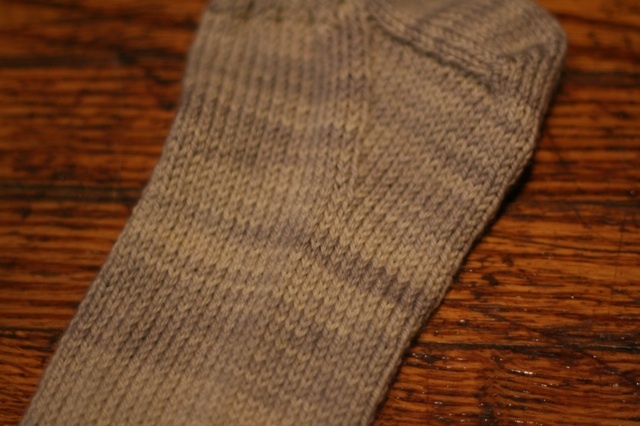 Right side – showing off the reversed middle stripes. Comparing the right side to the wrong side. I’m not always the biggest fan of straight-up garter stitch and I worried a lot that the colours would be too garish to wear with my bright red winter coat. Luckily, I ignored my initial misgivings, because this scarf is both warm and soft, and has garnered me many a compliment. I actually quite like that this looks”homemade” because, of course, it is. 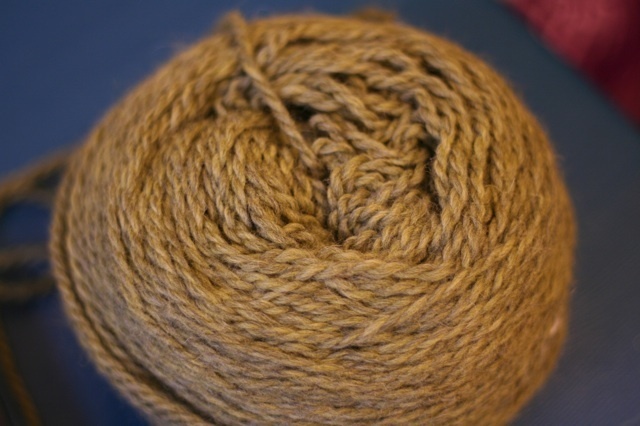 There’s something a little rustic about it, and although the wool is both thick and a little hairy, it is surprisingly soft around your neck while still feeling sturdy. I kind of like knitting that has a right and a wrong side (it looks cleaner somehow), so I made sure to start all my stripes on the same side. That also means all the weaving is in the same area, which makes things a little tidier. 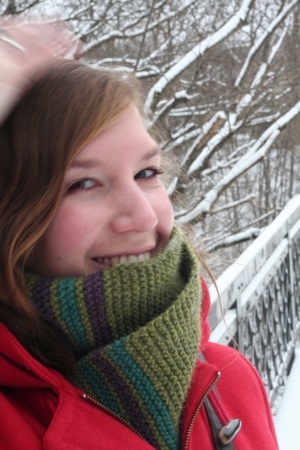 Fake Spring Scarf – so named because a) It’s in bright, springtimey colours, and b) It’s a nice quick knit, so when you’re hit with March snow you’ll have time to knit it up before it all blows out for the season. Cast on 30 stitches in main colour and knit in garter stitch for 7 inches. Switch to cc1 and knit four rows. Knit 2 rows in mc. Knit 4 rows in cc2. 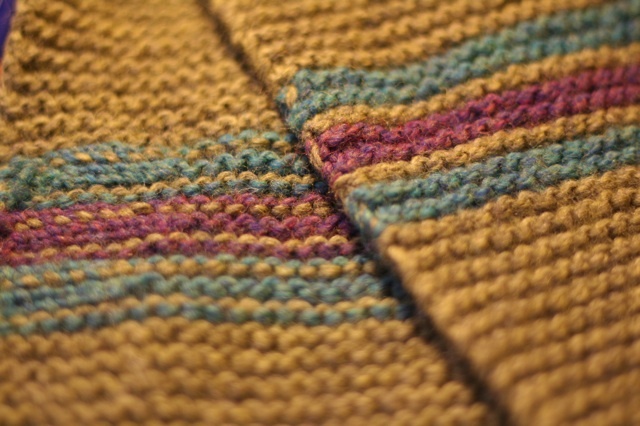 Knit 4 rows in cc1. Repeat five times, but on third rep, switch the order of the contrasting colours. Finish with 7 inches in mc. For the stripes, I cut the contrasting colours between stripes (leaving about a four-inch tail to weave in), but wove the main colour along the top. It’s a bit neater this way. And voila! A lovely scarf that will keep you warm and is still fun and colourful enough to make the transition to lighter jackets when real spring rolls around. 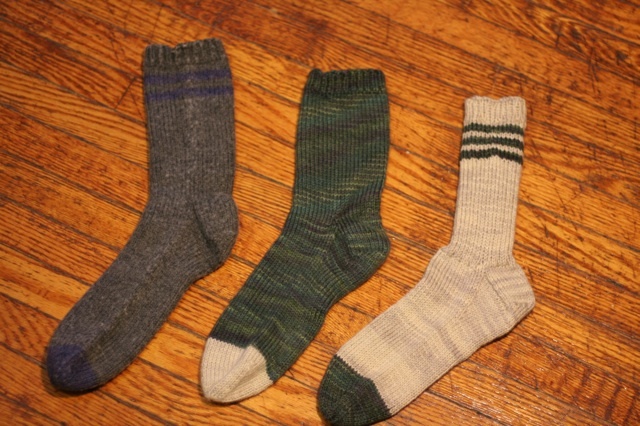 From left to right, three pairs of hand-knitted socks, in chronological order. These are all based on the same pattern, with a few variations. (The pair on the right looks skinny because of the rib, but I assure you it stretches out nicely). 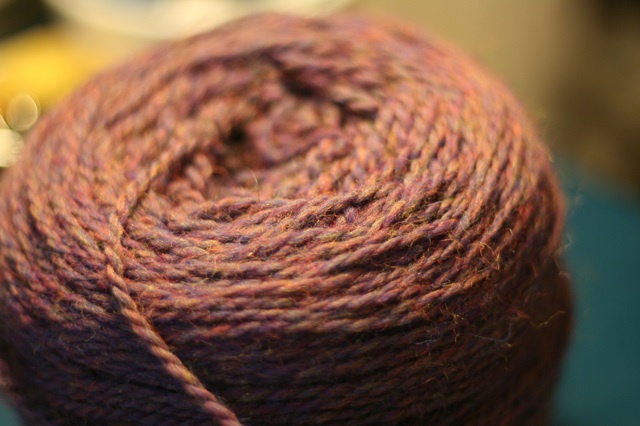 The grey and purple pair (knit with Berroco Vintage) were the first pair of socks I ever knit. 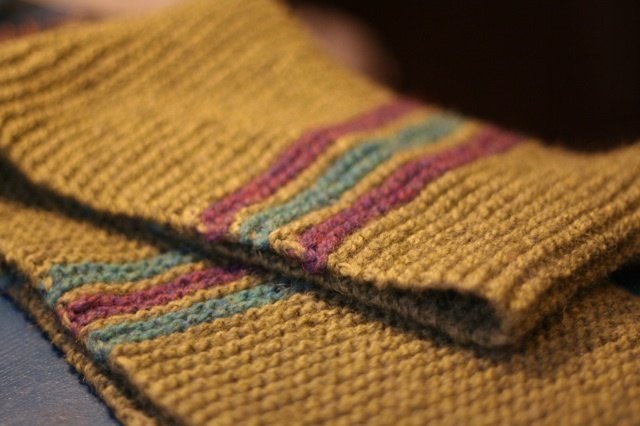 They took me almost six months to knit – well, two weeks for the first sock, and then I got distracted and then summer came – but they came out pretty well all things considered. The middle pair, knit on Tanis Fiber Arts Yellow Label DK weight 100% superwash merino, which, let me just say, is a gorgeous yarn to knit with. I used olive and sand and got that pair finished in a week over the Christmas holidays. They turned out much better than my first pair (go figure) and are both warm and light-weight. The pattern is pretty basic, but look at how nicely it shows off the hand-painted yarn. Gorgeous. The third pair are for my mom. They’re also knit with the other half of my Tanis Fibre Arts yarn, but with a 2×1 rib down the leg, because my mom found the leg on the green pair a little too tight. 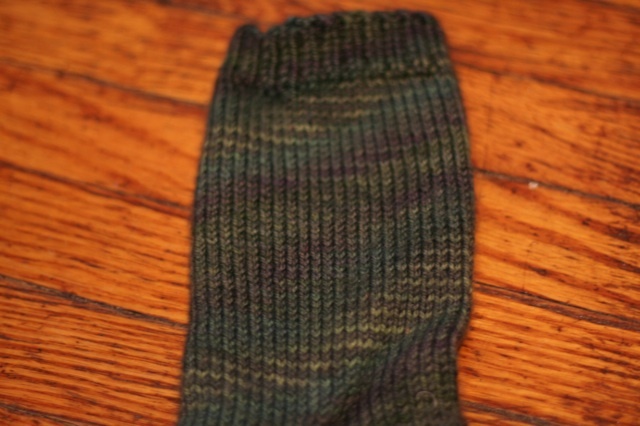 I went back and forth about knitting the heels in olive as well, but was worried I wouldn’t have enough; as it turns out, though, I certainly would have, so that’s something to keep in mind if you plan to knit these socks. Knit these two rounds until you’ve decreased half the stitches (that is, there are 20 remaining). Now work only round 1 until a total of 8 stitches are left. 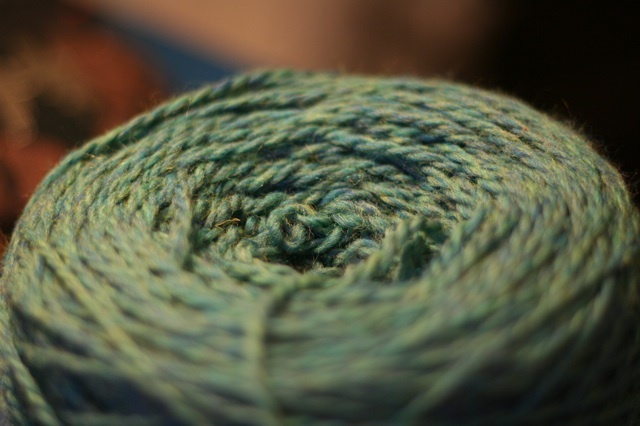 Break yarn and, using a darning needle, thread tail through remaining stitches and pull tight. Weave in ends.